Wildwood Campground and Picnic Area is off Route 112, approximately 4 miles west of Lost River Reservation near Kinsman Notch and 9 miles from the town of North Woodstock. 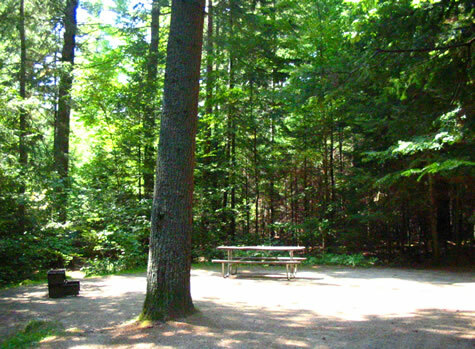 There are 26 non-reservable wooded sites with gravel pads, fire rings, and picnic tables. A self-service pay system collects the fees on a first come, first serve basis. Vault toilets are handicap accessible and equipped with cold water faucets. Refuse dumpster’s are provided; campers are encouraged to pack out their recyclables. 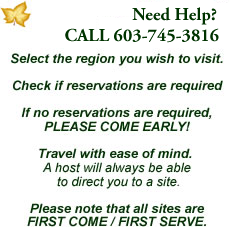 There are no hookups, dump stations, showers or group camping sites available. The picnic area is directly across from the campground, with it’s own water, waste containers, and restroom facilities. The Civilian Conservation Corps (CCC) built the picnic pavilion. A riverside setting offers one of the most beautiful views of Mt. Moosilauke. Moose are commonly seen along the banks of the Wild Ammonoosuc River. This river was the scene of major log drives in the 1900’s. * Allow no more than 8 people and 2 vehicles per site and keep all equipment (including tents, tables and motor vehicles) on the graveled area. This will minimize compaction, allow low vegetation to grow, and enhance privacy between sites. * Build all fires in the ring provided. “Only YOU can prevent forest fires,” says Smoky Bear. This will eliminate unsightly charcoal spots that soil camping equipment and clothing. * Observe quiet hours between 10 PM and 7 AM. Turn off audio devices during these times and play them at a reasonable volume at all other times. See the bulletin board for the rules about operating generators. * Gather only dead and down firewood. Remember that snags are Animal Inns (homes for many forest animals).